As a professional services engineer for BigFix, I’ve written my share of custom Fixlets, Tasks, and Analyses. During that time I’ve learned a lot about how the home office developers fill in the blanks related to designing your custom task. One day I sat down to come up with a way I should categorize my custom content that would be easily recognizable to any BigFix user. 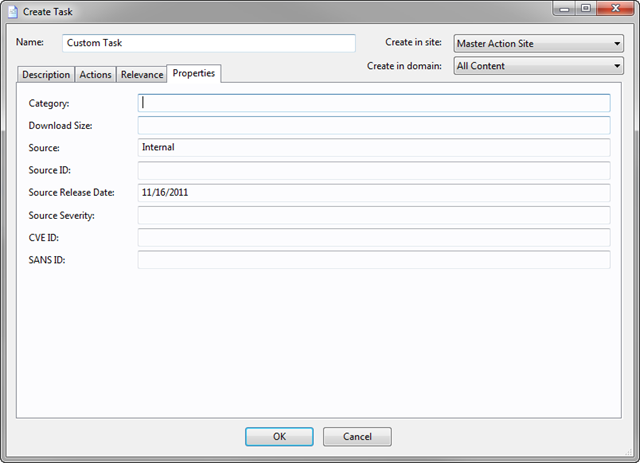 BES Client Setting – These are fixlets/tasks in which the end result is to configure a client setting. This could be simple tasks which directly configure the setting or very complicated tasks which go through many steps to determine which client setting to be configured. BES Server/Relay Setting – Just like the BES Client Setting category, this one relates to configuring Server or Relay settings. Configuration – Since I may be working with any product… like DropBox, Word, Excel, AVG, etc… I like to specify these in this category. It lets me know I’m working with a particular product and I’m needing to configure it in some way. Maintenance – This relates to tasks that will fix the product I’m working with some how. Usually I put my Watchdog tasks into this category. Since the goal of a watchdog is to monitor my “thing” and fix it if it breaks. Setting – This is a category setup specifically for changing the endpoint’s OS. I put tasks which change Windows settings like cascading the control panel menu on the start menu or adding a host to the Windows hosts file. Uninstall – This is pretty easy to figure out… if I’m uninstalling software or hardware… it gets this moniker. Update – This is the opposite of Uninstall.. installations go here. Whether it is a new installation or an upgrade.. they both go here. I configure the task to know the difference and take the appropriate actions. Download Size – Be sure to specify the download size in bytes. If I have a download command in my action script, I’ll just copy (add up if multiple downloads) and paste that value here. Source – Since my content is mostly customized to the customer… I like to put my email address here. This way if they have questions, they won’t have to look far for my contact information. Source ID – I typically put <Unspecified> here. I don’t have an ID which I can share… so I use the cop-out value. Source Release Date – This one’s easy… specify the date you started or last modified the task. Specify in M/D/Y format. Source Severity – This greatly depends on the content I’m writing. If I’m writing an upgrade to a software installation and if the previous version isn’t upgraded immediately it’ll cause damage to endpoints then this field deserves a “Critical”. Each of the values depends on the content. If I’m ever not sure or there is no priority to the content… use the cop-out value… <Unspecified>. The remaining fields relate to Microsoft, patching and such… I typically leave these blank. I hope this helps you decide how to fill in those extra fields in your customized content. Leave comments below for any self imposed standards related to your interaction with BigFix, err Tivoli Endpoint Manager.